Dining with Dara: What's new, food trucks? The old adage used to be that April showers brought May flowers. The new variation? 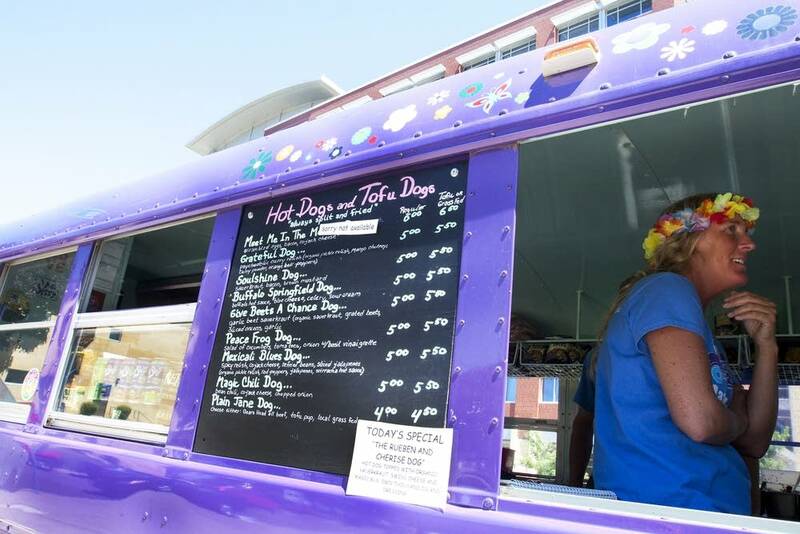 April vehicle inspections bring May food trucks. Tom Crann: Our regular food and dining correspondent Dara Moskowitz Grumdahl from "Mpls. St. Paul Magazine" is here to tell us about what's new in the world of Twin Cities food trucks. Welcome, Dara. Dara Moskowitz Grumdahl: Hi, Tom. Tom Crann: First, we should talk what food trucks are. Just what they sound like? DMG: Yes. 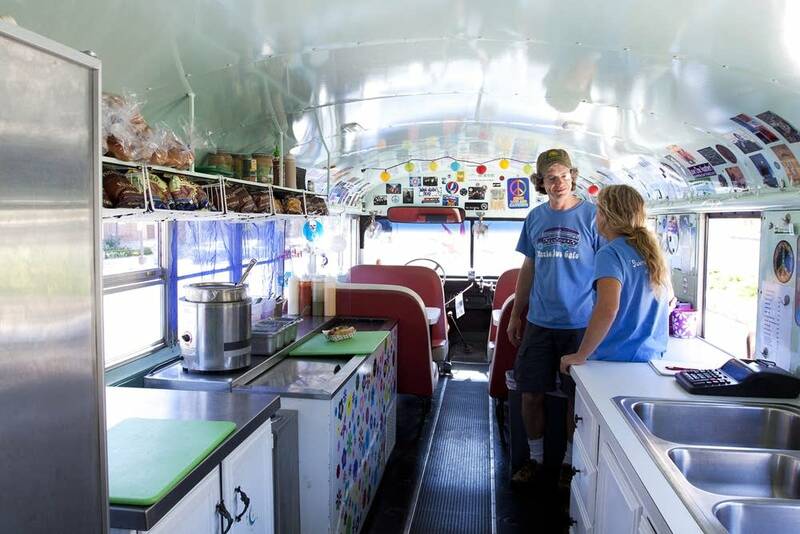 If you've got a kitchen licensed for commercial food production and a license from the City of Minneapolis and/or a license from the City of St. Paul, you are, for the purposes of hype and this conversation a food truck — even if your actual vehicle is a bus or a push-cart. Tom Crann: Hype, yes. There has been a lot of hype. DMG: And there's going to be more. Food trucks have been some of the biggest news in Twin Cities food the past couple years, with places like Hola Arepa, Vellee Deli , and the The Smack Shack . And the new season is about to kick-off. All the big St. Paul food truck food courts start next week, and in Minneapolis, a new food truck seems to show up every day. Tom Crann: The two cities of Minneapolis and St. Paul have different food truck cultures, don't they. DMG: Yes. St. Paul has evolved little cozy villages of food, which we call 'food truck food courts', while Minneapolis has developed what I think of as a two-tier system, Marquette Avenue plus a free-for-all. Tom Crann: Marquette in downtown Minneapolis, that's essentially a bus lane during rush hour, isn't it? DMG: Exactly, four lanes, all for buses and emergency vehicles. So between morning and afternoon rush hours the city essentially turns over the curb-side lanes to food-trucks. All the office workers up in their cubicles watch Twitter, because all the food-trucks use Twitter and Facebook to let people know where they're going to be, and then starting at 11 a.m. people flood into the streets to stand on line and Tweet about it to whoever's still sitting at their desks. Tom Crann: A whole lot of Tweeting going on. DMG: Yes, in St. Paul the trucks Tweet, and they use a hashtag, that is, the number signal (#) plus a word which allows you to speedily search Twitter for all the food trucks #foodtruckcourt. So far this year there are going to be three St. Paul food truck food courts — all of which are set to kick off the first week in May. Monday, Monday's food truck court includes 128 Mobile Cafe, Vellee Deli, and Hola Arepa, and will be at Wabasha and 5th, near the Ecolab building — Tom, that's the one that MPR lost due to light rail construction. Then comes Wednesday; Wednesday includes Chef Shack Gastrotruck , and Fork in the Road. On Thursdays, now, at Kellogg and Robert, near the river there will be a new food truck food court, with a mix of established and new food trucks, including Neato's Burgers, Home Street Home, Potter's Pasties and Pies, and Messy Giuseppe. Tom Crann: New food trucks? How many new food trucks are there in 2012? DMG: I actually don't know! There seem to be more coming out of the woodwork every day. There's one called the Bacon Trolley that debuted this week, another new one called Neato's Burgers which has French fries cooked in duck fat — a foodie obsession with many, including me. Foxy Falafel , which only used to have a bike, now has a truck. Anchor Fish and Chips is launching a truck sometime in the next month. There's a locavore one called Home Street Home which will have meat from Buffalo, Minn., and pulled pork slow-cooked in Summit IPA served on St. Paul's own Agnes Baking Company bread. Bloomy's Roast Beef just launched — a kickstarter success story, dedicated to slow-roasted roast beef sandwiches, in a truck. There's also the current category leader for crazy unhealthy: Tot Boss , which includes, yes, you guessed it, bacon wrapped tater tots, which you dip in cheese sauce. They're launching May 1. There is even at cupcake truck, Cupcake Social . I can't even figure out if that's very 2012, or very 2011. Tom Crann: So do you have a favorite? DMG: No, not yet. It's too early. Half of the new ones haven't launched yet, and there are more coming — there's an Aussie's Kebabs place that just got funded on Kickstarter. DMG: It's a thing, I guess. But that's what's magical about this food truck phenomena: The start up costs are low, the number of customers willing to take a flyer on something new is high — all you need is four wheels and a dream at this point. 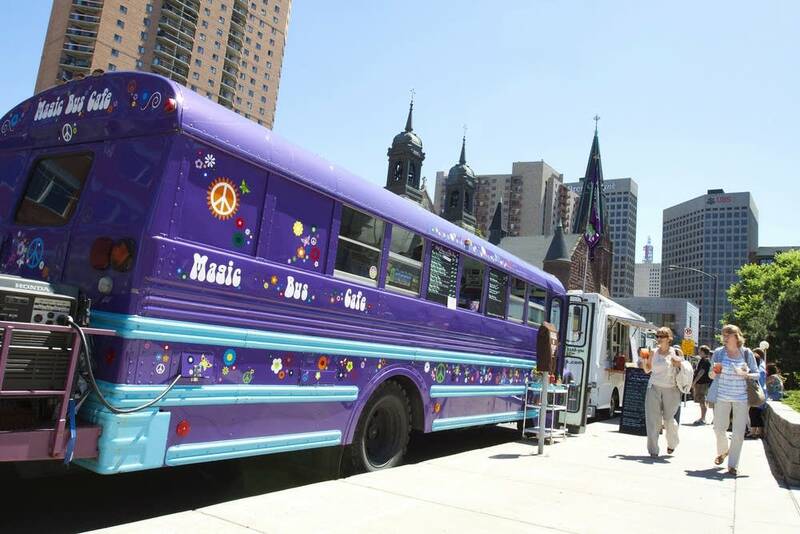 And in Minneapolis the Park Board is going to release a plan in June which would allow food trucks into city parks. This plan will need community approval, city council approval, and so on, but if it happens, get ready for there will always be Motor City — but the Twin Cities might just become known as Motor Snacking City.